Pink & Blue Bisexual pride biangle badges. 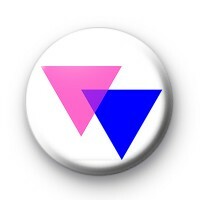 The crossed pink & blue triangle design represents the bisexual community. We have a range of LGBT badges, gay pride badges, lesbian badges & bisexual badges available ont he website. Have a browse through our Pride category or use the search box to search for your designs. Standard 25mm button badge made in our UK workshop.